i arrived sometime in the early morning hours. this was the longest flight i was ever on but i didn’t feel too tired. the excitement of being back in europe probably helped. the weather outside wasn’t that inviting and i took my time to assemble the bike before calling felipe, a friend who offered me a place to stay. it was an amazingly chilled out week while i stayed in paris and the great shock coming from zealand into the big crowded city failed to appear. wikipedia states the density of population with 6.6 per square kilometer for the south island of new zealand and a staggering 21.196 for paris. well, without the bike i was but one of many in the streets. one evening i went out for dinner with sophie and laure. i know them from the time we were all living in berlin. laure’s recommendation to visit the san miniato al monte in florence was also the first station of the worldtourguide i visited. 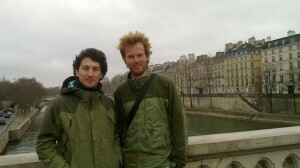 here with felipe at one of the many bridges over the seine during one of our strolls through paris. thanks again felipe for your hospitality!! i took the train out of the city to avoid traffic and started cycling from belfort. next destination germany.